It has finally arrived “Pumpkins and Spice” is in the store! Yes, finally Red Roosters Pumpkins & Spice Collection has made it to the store. For those of you who have already place and order we are working on processing them. They will be mail as soon as we have them complete. Thank You for your patience. For those of you who have not ordered yet, now is the time. You don’t want to be left out Order Today. 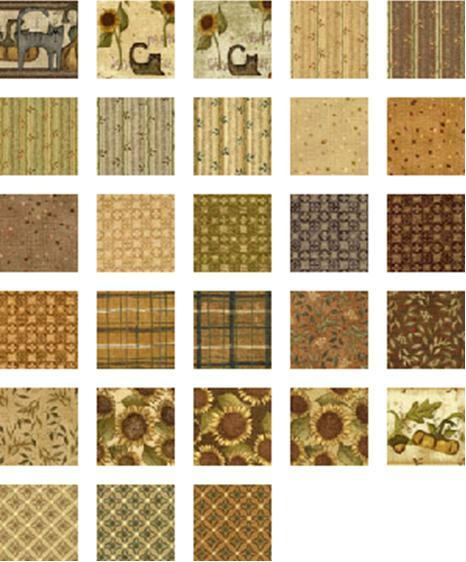 We have a Pumpkins & Spice Kit, Book, Fat Quarter Bundle and a 1/2 Yard Cut Bundle available. This entry was posted on Friday, August 21st, 2009 at 4:13 pm and is filed under Uncategorized. You can follow any responses to this entry through the RSS 2.0 feed. You can leave a response, or trackback from your own site.